3. YELLOW AURA COLOR: Relates to the spleen and life energy. It is the color of awakening, inspiration, intelligence and action shared, creative, playful, optimistic, easy-going. 5. BLU AURA COLOR: Relates to the throat, thyroid. Cool, calm, and collected. Caring, loving, love to help others, sensitive, intuitive. 6. INDIGO AURA COLOR: Relates to the third eye, visual and pituitary gland. Intuitive, sensitive, deep feeling. 7. VIOLET AURA COLOR: Relates to crown, pineal gland and nervous system. The most sensitive and wisest of colors. This is the intuitive color in the aura, and reveals psychic power of attunement with self. Intuitive, visionary, futuristic, idealistic, artistic, magical. 8. LAVENDER AURA COLOR: Imagination, visionary, daydreamer, etheric. 9. SILVER AURA COLOR: This is the color of abundance, both spiritual and physical. Lots of bright silver can reflect to plenty of money, and/or awakening of the cosmic mind. 10. 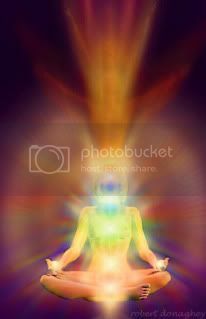 GOLD AURA COLOR: The color of enlightenment and divine protection. When seen within the aura, it says that the person is being guided by their highest good. It is divine guidance. Protection, wisdom, inner knowledge, spiritual mind, intuitive thinker. 12. WHITE AURA COLOR: Reflects other energy. A pure state of light. Often represents a new, not yet designated energy in the aura. Spiritual, etheric and non-physical qualities, transcendent, higher dimensions. Purity and truth; angelic qualities. 13. EARTH AURA COLORS: Soil, wood, mineral, plant. These colors display a love of the Earth, of being grounded and is seen in those who live and work on the outdoors....construction, farming, etc. These colors are important and are a good sign. It is a super fascinating... does it count if the person themselves sees the white flashes and the sparkles? I've had researching these meanings on my ToDo list. Timely post. Thanks. Yay on the timing! Good luck with your research!